Drumroll, please! 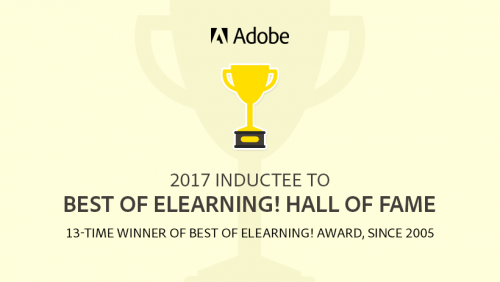 Adobe has been inducted to the 2017 Best of Elearning! Hall of Fame, in the very first edition of this honor. Established thirteen years ago by the Elearning! magazine, the Best of Elearning! Awards felicitate the creators of outstanding solutions. The Hall of Fame honor was added this year to recognize a brand’s continued contribution towards eLearning. Adobe Captivate, the flagship eLearning authoring tool from Adobe, has been the torchbearer in helping Adobe win the award 13 times – since 2005 – for a range of eLearning solutions. What lies behind the exceptional track record of Adobe Captivate? How does Adobe consistently anticipate learning requirements, provide futuristic solutions, and exceed customer expectations? These were some of the questions posed to Priyank Shrivastava, Director of Marketing, Adobe, in an interview with the editors of the Elearning! Magazine. Shrivastava gives credit to the “culture of innovation and customer centricity.” He goes on to say that the brand continues to lead the category as the product teams are always clued in to customers’ pain points and work hand-in-hand with the L&D teams of customer organizations to design solutions that address their problems. Success brings humility and Adobe Captivate is not resting on its laurels. Adobe continues to develop solutions that leverage the latest technologies to facilitate innovative and immersive forms of learning – continuously making it easier for authors to design and for learners to consume anywhere, anytime, on any device. Experience the power of the award-winning smart eLearning authoring tool. Outstanding! Congratulations to the Adobe Captivate team! Congratulations once again! Good Job! Congratulations to the Adobe Captivate team!